"Bledine Jacquemaire is preparing new a generation of athletes”. Beautiful French advertisement created in 1906 by Joseph-Leon JACQUEMAIRE. 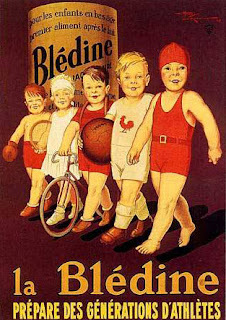 “Bledine” supposed to be a food for babies, to be considered as the most important apart milk; It was a power containing corn, lactose, minerals and sugar aiming to attract the young athletes. We assume that the young swimmer at the right, used the ball to start playing Water Polo as well……..